I’ve just emailed Rosa as I submitted on day one and mine is still under review weeks later. @Macgyver15 I submitted not long after you on first day, but I don’t know if they are doing it on first come first served basis. I also submitted on day one, so we'll have to wait and see. Thanks Anker! 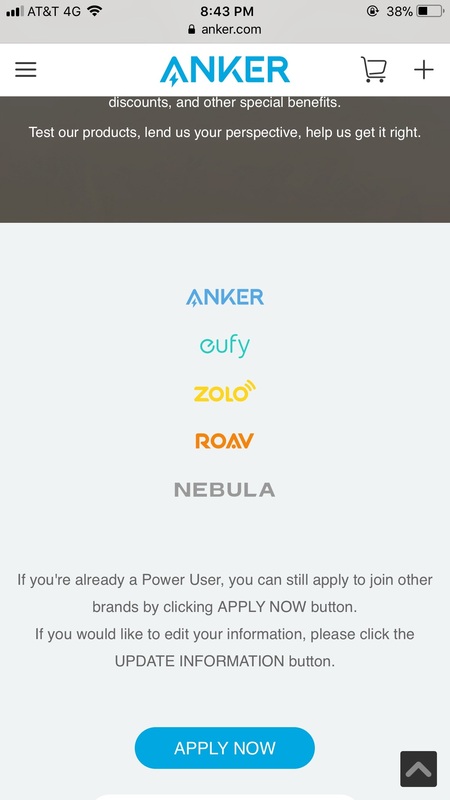 Finally got approved to all power user platforms except Nebula. Hope to get some great samples to review. Interesting, I'm now seeing USA flash codes under my power user page @AnkerOfficial ...any other UK members getting the same? Yes that's I have on my page. Has been like that for days now. Yeah @ndalby mine is the same. Anker said it should say £ and will fix ASAP. Hmmm, I'm still waiting..... still under review. I wonder if they forgot me? LOL. I got the same, emailed them a screen shot to let them know. The codes actually do work on UK amazon. Just change the $ for a £ and it seems to be accurate. To all of those that are still waiting like I was, I emailed Rosa on Friday and she messaged me back this morning and apologised for her late review of mine and approved me for Eufy, Roav and Zolo. I’d definitely shoot her an email @elmo41683, @Nhi and @Flubber it looks like some of us might have got lost in the shuffle with so many applying for it. I just send them an email to marketing@anker.com is it the righe email?